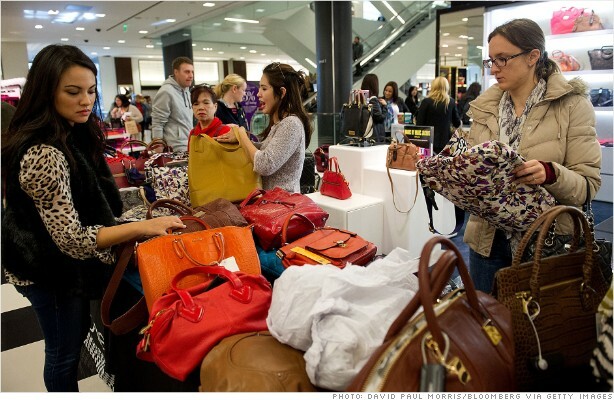 It's been a couple of tough months for retailers, no thanks to Superstorm Sandy. Sales fell for the first time in four months in October, but rebounded in November, which evened things out. But December isn't shaping up to be as strong as many had hoped. And that's weighing down retail stocks, including Amazon (AMZN), Coach (COH), Michael Kors (KORS), Limited (LTD), Macy's (M)and others, say StockTwits traders. $AAPL $AMZN $XLY leading market lower as investors bet holidays didn't quite live up to high expectations. Although I do find it a bit surprising that people had such lofty expectations, given the uncertainty surrounding the fiscal cliff and the economy overall. Even though jobs have started to come back, the pace of growth is anything but consistent. That's also a potentially troubling sign since luxury generally manages to weather the downturns. Even online retailers are taking a hit. A slowdown in retail sales doesn't bode well for the broader market either. Here's hoping the post-holiday sales will help make up for some of the lost revenue. And if lawmakers can get their act together over the fiscal cliff, we may be lucky and get a January surprise.